I have always thought Samantha Brown has the absolute best job in the world. She travels to some of the most exotic locations. She stays in some of the world’s best hotels. She eats in some of the best restaurants. All in front of a camera and she gets paid for it! Wow! What a job! Disney, DVC, and Samantha Brown have teamed up to create a webinar preview of Aulani starting tomorrow, May 17, 2011. The webinar is on demand and may be viewed anytime during the day. I received my email invitation from the Disney Vacation Club on May 6th and I immediately signed up for the webinar: Disney Traveler Presents – Behind the Magic in Hawai’i with Samantha Brown. Once again Samantha has gone to one of the most exotic of locations to one of the best resorts to bring us a behind the scenes look at Aulani. As a Vacation Club member I received an invitation to the webinar. However, it is available to all our readers through http://www.dvcfriends.com/ . Disney Traveler with Samantha Brown is running May 17, 18, 19, 20, and 21, 2011. It is free but you must sign up for the webinar on the DVCFriends website (just click on the link above). As of the May 16th registration still appears to be open, but don’t wait long or you could miss out. When I start talking about Disney Vacation Club, I feel I must include the disclaimer that I do not work for Disney or Disney Vacation Club or any related organization. However, I have talked to people who have subsequently bought into DVC. DVC does give member awards for referring new members. So when you purchase your DVC points at Aulani, please use me as a reference. :-) Seriously, the webinar does have the disclaimer from Disney: THIS PROMOTIONAL MATERIAL IS BEING USED FOR THE PURPOSE OF SOLICITING SALES OF TIMESHARE INTERESTS. But neither I nor Growing Up Disney receive anything for you signing up to watch the webinar. 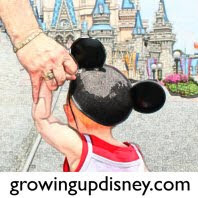 If you don’t want to watch the webinar, keep watching Growing UpDisney as I will be writing more about Samantha Brown and what information she brings about Aulani, a Disney Resort and Spa, Ko Olina, Hawai’i.